One of the best advantages of decking is that it covers a multitude of sins; instead of perfectly levelling an area, you can simply pin down some weed-suppressant membrane and build over the top, creating one large space or a number of terraces if your garden’s particularly steep. If you’ve got some basic carpentry skills and the right tools, then this is a great project to take on. But don’t worry if you don’t think you’re quite up to the task – getting professionals in to do the job can be affordable too. When you’re considering the cost of decking, it’s worthwhile looking at all your options, including hiring tradesmen. Though getting a decking quote is likely to make the job more expensive, once you factor in the need to buy or hire additional tools, as well as purchase all the materials, the difference in cost mightn’t be as great as you think. Of course, if you’ve already got a shed full of equipment, you’ll only have to pay out for the timber and fastenings themselves, plus you’ll have the pride of doing it yourself too! One factor that will obviously affect decking costs is the scale of the project. The larger the area is, the more materials you’ll need. It’s also important to bear in mind that terraced decks will require steps and balustrades, both of which can increase the cost of a project significantly. It’s also extremely important to abide by local planning laws. For example, whilst decking isn’t considered a permanent structure, many councils have limits on how much of a garden can be covered. In addition, because decking is elevated and might impinge on a neighbour’s privacy, building permission may be required. A simple garden project could become extremely costly if you accidentally break the law. Other than the actual size of your deck, the largest factor for cost is the various timber decking prices. Like any other product, there’s a wide variety of wood you can use for decking, from cheaper softwood to robust hardwood that comes with non-slip grooves and can be clicked into place so there are no visible screws. Softwood – This type of decking board has the advantage of being the cheapest but may not last as long as hardwood options. Prices vary according to seasonal fluctuations and retailer discounts, but you can expect to pay between £300 and £500 for timber to cover 15m². If you want to hire professionals, the same area should cost just over £1,000 and a little higher in London. Hardwood – For a long-lasting deck that’s got great garden appeal, hardwood is essential. However, the luxury of such boards is reflected in the price. To cover 15m², expect no less than £750, whilst hiring professionals can cost between £2,000 and £3,000. As an aside, it’s also important to remember that cutting, shaping and dealing with hardwood is far more difficult than softwood. Combined with the higher price, it means mistakes are much more costly. If you’re attempting DIY, and particularly if it’s your first decking project, starting with a softwood material will be easier. 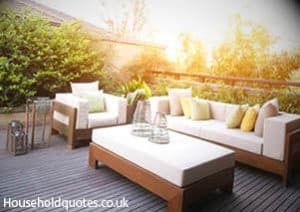 There are number of other things to bear in mind regarding decking prices, especially when you’ve decided to get in the professionals. Websites like Rated People are a great resource for finding local experts, but it’s important to ask the right questions. For example, costs can be lower when decking is built on top of a pre-existing patio area. In addition, any undulating ground or planted areas can push costs up, so even if you’re not constructing the decking yourself, it’s worthwhile spending a few days clearing and levelling the area first, if possible. In addition, for those on a budget, try and plan a deck with as few balustrades and steps as possible. A simple shape is also cheaper and easier to construct. Decking installation costs needn’t be expensive, especially if you’re taking it on as a DIY project. And by asking the right questions and taking time to plan, most decks are affordable, no matter the budget. Get Your FREE Decking Quotes NOW!